We had always planned to have an Ottoman for use with the couch as well as the swivel seat. 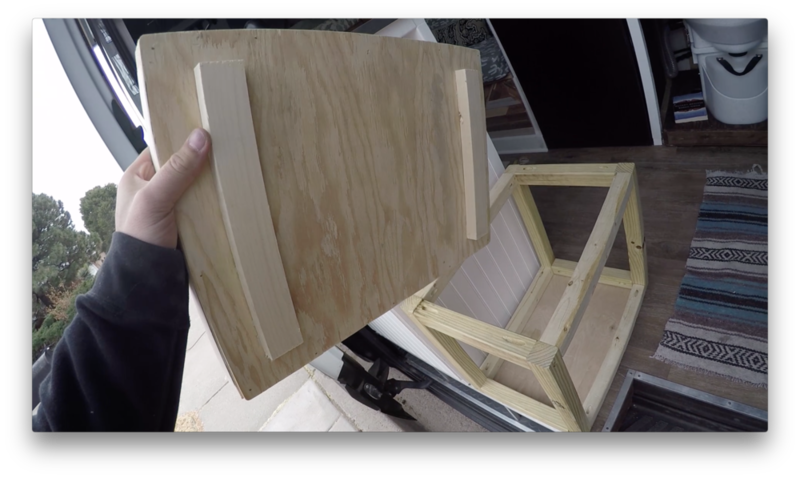 After getting comfortable in the van during the build and testing it out we realized that building the ottoman was the missing piece. We also needed the ottoman for laundry, coconut coir, and other random things. The ottoman was a quick and easy build, that was almost made with all scrap. I measured the height of the couch and built a frame out using 1x1’s. I used the beaded masonite that we used for the kitchen countertop siding. The cushion was made from the remainder of the couch cushion. The cactus fabric was sewed by Dani and was left over from the couch. We put short office type carpet on the base so it could slide easier and not scratch the flooring. We pin nailed all the siding to the frame and used caulking to clean up the edges, we could have used siding to clean it up but we were ok with the caulking. This was a very straight forward build and didn't take much time. It is a mandatory piece for our van. It is very multifunctional piece all in all it’s storage, laundry, an ottoman, a step for the bed, an extra seat, and the cushion doubles as a bed extension.